The SRP series is Aplus Finetek’s rotary paddle bin level indicator product line. It is an affordable rotary paddle bin level indicator type point level sensor with state-of-the-art features including a universal 20-250VAC/VDC power supply and an adjustable time delay for its relay outputs. The universal power supply means you only need a single device even if you require AC and DC versions or a broad range of voltages such as 24VAC, 24VDC, 115VAC and 230VAC in your rotary paddle bin level indicator. No matter what the voltage, the SRP with universal power supply will handle it. In addition, the SRP rotary paddle bin level indicator with universal power supply uses an AC drive motor rather than the DC motors used by other brands DC powered units. This means the SRP rotary paddle bin level indicator will last much longer than those brands using DC brush-type drive motors that have a very limited lifespan. The adjustable time delay provides a 0-12 second adjustment to eliminate nuisance alarms due to shifting and surging materials. These advanced features are typically found only on much more expensive technologies and units. In addition, the SRP rotary paddle bin level indicator has an easily adjusted sensitivity (no disassembly required), a fail-safe output on power failure, local LED indication with an extra-large lens, pluggable terminal blocks for ease of wiring, and an extremely wide range of accessories and features. 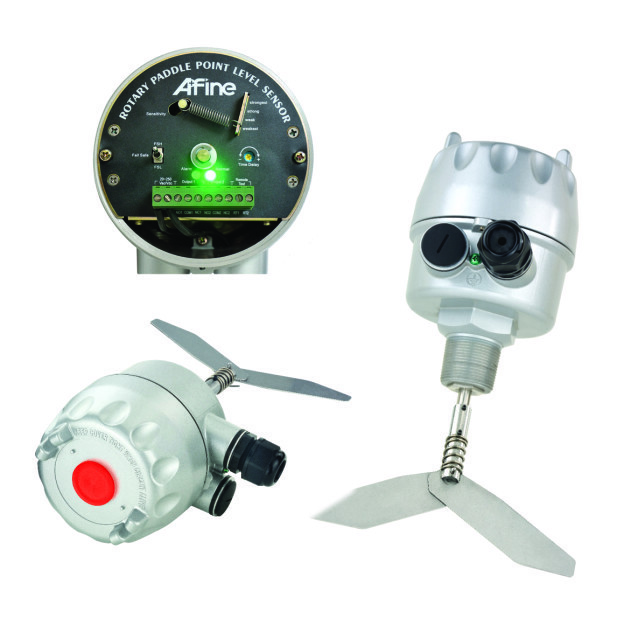 For more information look at our SRP Series product page and contact Aplus Finetek Sensor, Inc. at 815-632-3132 or email us at info@aplusfine.com.